BORN: 1836 in Giles County, TN. DIED: 1911 in Memphis, TN. CAMPAIGNS: Stone's River, Chickamauga, Chattanooga, Kenasaw Mountain, Atlanta, Franklin and Nashville,. George Washington Gordon was born in Giles County, Tennessee, on October 5, 1836. He grew up and was educated in rural Mississippi and Texas. 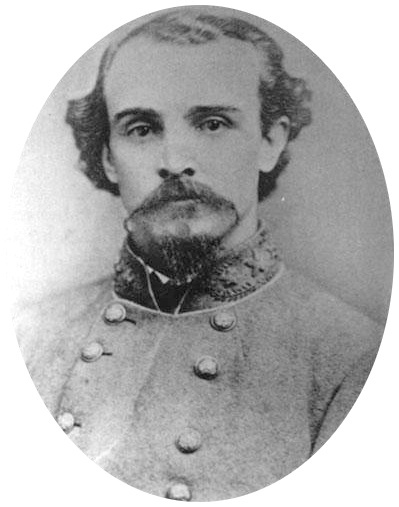 At the Western Military Institute in Nashville, Tennessee, he studied engineering under Bushrod R. Johnson, future Confederate general. After graduating in 1859, he became involved in surveying. In 1861, he joined the Confederate military as drillmaster of the 11th Tennessee Infantry. He served in East Tennessee, first under Brig. Gen. Felix K. Zollicoffer, then under Maj. Gen. E. Kirby Smith. Gordon fought in the Battles of Stone's River, Chickamauga, Chattanooga and Kennesaw Mountain, as well as the fighting in Atlanta. He was appointed a brigadier general to rank from August 15, 1864. Gordon led a brigade in Gen. John B. Hood's Franklin and Nashville Campaign. Commanding troops at the Battle of Franklin in 1864; he penetrated deeper into the Union center than the rest of the Confederate force, but was wounded and captured. He spent the rest of the war as a prisoner, ending the war in Fort Warren, Boston. In July of 1865, he was released. Gordon moved to Memphis, Tennessee, and studied law. After becoming an attorney, he worked as a state railroad commissioner, a US Indian agent and a school supervisor in Memphis. He was the last Confederate general to serve in the US House of Representatives, entering Congress in 1906 and being reelected twice. Gordon was made commander-in-chief of the United Confederate Veterans twice, and died in Memphis, Tennessee, on August 9, 1911.